Planning to cook a whole turkey? Use our Whole Turkey Calculator below to estimate what size of whole turkey you will need, how long it may take to thaw, and how much time it will take to cook. Suggested cooking temperature is 350°F. Roasting temperature can be found here. For more information on how to prepare a whole turkey, please refer to our 8-part Turkey Basics: Whole Turkey video series. 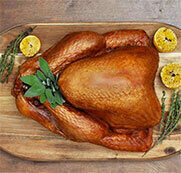 The most common sizes of whole turkeys found in stores will range between 8 lb to 25 lb. Please keep in mind that these calculations are estimates only and are based on suggested 1 lb person or 1.5 lb per person if planning for leftovers. Remember cook once and use any leftovers in these delicious turkey recipes.